First Endurance offers safe, legal and stimulant-free products that are developed to help endurance athletes optimize performance. With First Endurance, you'll be able to race harder and recover faster than ever before. Optygen is a revolutionary endurance formula that's designed to help you optimize performance, maximize oxygen utilization and achieve greatness. The patent-pending, legal, safe and stimulant-free Optygen formula is based on human clinical trials and the latest scientific research on increasing endurance. It's so effective, there's a 100% performance guarantee. Multi-V? is the first multinutrient vitamin that's clinically proven to enhance endurance The nutrients in Multi-V have been shown to effectively protect athletes from the stresses of exercise and to improve endurance. Multi-V is the only multivitamin that contains Carbogen®, a patented enzyme blend that's been shown in clinical studies to improve carbohydrate utilization and increase time to exhaustion significantly. Multi-V is unlike any other multivitamin available. This unparalleled formulation contains a number of special ingredients (besides vitamins and minerals) that address the unique requirements of endurance athletes. In addition to having the highest-quality, most bio-available vitamins and chelated minerals available, this special endurance formula delivers clinically effective doses of Enzymes, Iron, Green Tea, Ginkgo Biloba and Omega-3 Fatty Acids. Multi-V is also formulated with Ferrochel Iron- a highly bioavailable source of Iron which is non-toxic and does not affect the absorption of minerals, like other Iron sources do. Racing and intense training puts your body under incredible stress, depleting glycogen stores, elevating cortisol and draining essential vitamins and minerals. For endurance athletes, it's crucial to focus on recovery in order to be competitive the day after a hard workout or race. That's why the scientists at First Endurance developed Ultragen, the most advanced post-recovery formulation ever produced. Each serving of Ultragen delivers the levels of nutrients that have been shown in clinical research to maximize recovery and give you an extra edge over the competition. In other words, First Endurance does not use "pixie dust" levels of ingredients just to put on the label. Research has shown that there is a critical thirty-minute glycogen window (called the "window of opportunity") immediately following exercise when insulin sensitivity is at its highest and exhausted muscles essentially open the door to nutrients. If nutrients are not absorbed quickly enough, however, this opportunity for maximum restoration is lost. But it's not just when nutrients are absorbed, it's also about which nutrients are available. The body is extremely complex, requiring more than sugar and protein to fully recover, so recovery is limited without a precise balance of nutrients entering the cell. Ultragen's many components are designed to work synergistically in order to fully maximize recovery, providing the right nutrients to the right place at the right time. All proteins are not equal. Ultragen utilizes a special combination of the most advanced proteins available, each one offering unique recovery attributes. For example, Ultragen includes hydrolyzed protein because it is enzymatically predigested in small, easy to digest di- and tri-peptide chains that are quickly absorbed and digested within the critical glycogen window. Fast acting, Whey protein isolate delivers high levels of anti-catabolic branch chain amino acids. Milk Protein Isolate is a high biological value protein which takes longer to fully absorb. High glycemic carbohydrates (sugars) are rapidly absorbed by the body and are easy to digest. Glucose, which has a glycemic index of over 100, is absorbed faster than any other sugar available. Ultragen contains 60g of glucose because studies show that high glycemic carbohydrates taken after exercise create a catalyst, which increases the uptake of glutamine, branched-chain amino acids, vitamins and minerals into exhausted muscle. Excess cortisol levels have been shown to suppress the immune system, increase the risk of upper respiratory infections and depress levels of testosterone. In addition, excessive cortisol levels can put the body in a catabolic state- where it breaks down muscle and store fat. Ultragen offers a synergistic blend of vitamins, minerals, co-factors, glutamine and BCAA's specifically designed to modulate the damaging effects of cortisol brought on by intense endurance training. Intense physical exercise drains Glutamine stores faster than the body can replenish them. When this occurs, the body breaks down muscles and becomes catabolic. Ultragen is formulated with a 6 grams of Glutamine for its anabolic and anticatabolic properties. Research has shown Glutamine supports glycogen and protein synthesis and increases nitrogen retention, which means it's essential for muscle tissue repair and recovery. Considered the building blocks of the body, BCAAs are important for muscle growth & recuperation. In addition to building cells and repairing muscle tissue, BCAAs form antibodies that combat invading bacteria & viruses. Your body cannot manufacture its own BCAAs so they must be supplied through your diet and supplementation routine. Athletes, especially endurance athletes, need higher levels of specific vitamins minerals and electrolytes to help restore energy levels, fight free-radicals and maintain a healthy immune system. Ultragen provides the high-potency vitamins, minerals and electrolytes your body requires to maximize recovery. EFS (Electrolyte Fuel System) energy drink combines the latest clinical research and technology with input from some of the best endurance athletes in the world. The result: a great-tasting energy drink that provides ALL the ingredients you need to maximize endurance. Clinical research shows endurance athletes require much higher levels of electrolytes than most sports drinks provide in order to prevent cramping and dehydration. 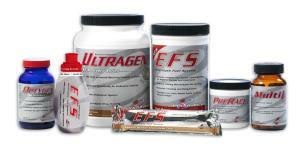 Each serving of EFS provides all five electrolytes in the levels endurance athletes need to stay hydrated and maximize endurance. So you don't have to carry extra electrolyte pills or bother adding anything to your energy drink anymore. Honored with Health Magazine's ''Best In Food'' award, these delicious bars supply all natural food for extra endurance, fast recovery and meal replacement.